Baxter and Sawyer are two human-scale collaborative robots with outsized personalities, Baxter and Sawyer can be trained to perform a task in a matter of minutes, With a true train-by-demonstration method, Employees can deploy & redeploy automation quickly and effectively, So saving time & money, Baxter and Sawyer can adapt to real-world variability, change applications quickly and perform tasks like humans do. Baxter robot is an industrial robot, Baxter is a two-armed robot with an animated face, It is 3 feet tall and weighs 165 lbs without its pedestal, It is used for simple industrial jobs such as loading, unloading, sorting, and handling of materials, Baxter is designed to perform the dull tasks on a production line. Baxter robot has an animated screen for a “face” that enables it to display multiple facial expressions determined by its current status, There are sets of sensors on its head that help it to sense the people nearby and give Baxter the ability to adapt to its environment. Baxter runs on the open-source Robot Operating System on a regular, personal computer which is in its chest, Baxter can be placed on a four-legged pedestal with wheels to become mobile, Baxter robot has extra sensors in its hands that allow it to pay very close attention to detail. Baxter robot can be programmed by moving its hand to perform a task whose motions computer will then memorize and can repeat the task, Extra dials, buttons, and controls are available on Baxter’s arm for more precision and features, While most of the other industrial robots require computer programmers to code them over many hours, programming Baxter robot can be done by unskilled workers in a few minutes. Many universities are using Baxter as part of their course in Robotics now, Mechanical Engineering and Computational Sciences are used to give students the experience of using current robotics technology to offer practical applications in the real world. Baxter robot provides many advantages over traditional robots in that no cages are required for usage and students can work alongside him in the classroom environment without the potential of accidents, This feature is also useful for Baxter’s application in commercial usage. Baxter robot has sensors in its hands and around its arms allowing it to detect and adapt to its surroundings, This helps it to sense potential collision early & it can reduce the force before the impact, Extra sensors & cameras within Baxter’s hands enable it to pay attention to detail while working with its hands, These extra sensors & abilities makes Baxter robot less hazardous. Humans are still needed to supervise and teach Baxter to perform tasks, Baxter robot is not a threat to human jobs because Baxter’s ability is limited in tasks such as quality assurance or small assembly where things like sensing tension are important, a human is unlikely to be replaced by robots like Baxter. Baxter robot performs the repetitive task of line loading, machine tending, kitting, packaging, and material handling, It simulates the task of moving things around repetitively for hours, Baxter robot can be manually-trained by in house staff to perform specific tasks, It has a camera in order to see what it is doing, It has a form of feeling to be trained to do certain tasks, It is affordable, it makes jobs for maintenance, Baxter costs $22,000 as a base model. Baxter robot can be altered to do a lot more kinds of jobs, like simple assembly and sorting, It’s much easier and more affordable for smaller companies to integrate Baxter into their workplaces, Baxter robot can work alongside humans without risk of injuring them due to its built-in safety features, It can adapt to its surroundings due to many sensors, It has been programmed to have a certain level of common sense. 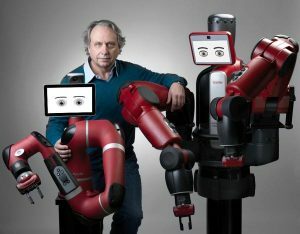 One of the main differences between Baxter and other industrial robots is the price, Most industrial robots cost $100,000 or more to purchase, and much more to maintain & operate due to the need for programmers to write the code that controls them, They need to have specialized environments built around them to work efficiently and keep humans safe, so you have to factor in engineering & construction costs, This requires a substantial investment. Baxter robot requires far less expertise & time to instruct than most industrial robots, rather than requiring high-level technical staff to spend days, weeks or months programming (via code or the use of a push-button pendant), It comes with an intuitive user interface via the facial expressions and it prompts displayed on its screen, The non-technical person can teach it what to do through the arm movement and simple button presses, and it can master a new task in half an hour, There is little assembly or setup required. Baxter robot knows that if it drops an object, it needs to stop and retrieve another before continuing its motion, it can adjust accordingly if a conveyor belt speeds up or slows down, Baxter’s adaptability and safety help it to be plopped onto an existing assembly line without too much fuss. Baxter has some limitations in that it is not as fast or precise as existing factory robots, it can’t do heavy lifting, It’s more adept at the human than the superhuman, Baxter robot could be used to fill new roles so that the tasks could be automated relatively cheaply, Baxter takes away some low-paying and boring jobs. Sawyer is a high-performance collaborative robot, It is a revolutionary collaborative robot designed to execute tasks that have been impractical to automate with traditional industrial robots, Sawyer gives the manufacturers high-performance automation they need while maintaining the flexibility, safety and affordability synonymous. Sawyer has a small compact footprint, long reach, With 7 degrees of freedom and a 1260 mm maximum reach, 4 kg payload and 0.1 mm task repeatability, it is shipping globally to manufacturers in all industries, Sawyer fits into a variety of work cells, even ones already designed for people, It can maneuver into tight spaces, and around fixtures and doors, much like the human arm. Sawyer has an embedded Cognex Vision System in its arm that helps the Robot Positioning System and other complex vision, It can seamlessly integrate an external camera in minutes to leverage in-house systems, Built-in force sensing capabilities allow it to make the adaptive decisions as tasks run, enabling Sawyer to work precisely (+/- .1 mm), while operating safely next to people. Sawyer offers a high-resolution force control, due to sensitive torque sensors embedded into every joint, Sawyer’s built-in force sensing enables you to control force where delicate part insertion is critical, or enables you to use force feedback in tasks where you need to verify that parts are seated properly, Sawyer is inherently safe, It is designed to work alongside the people. Sawyer has a compliant arm design that is floppy and inaccurate, It offers unproven durability, it offers a few use cases, It has many plastic parts, It has limited usefulness of on arm buttons, It may need covering to prevent accidental use, It has a limited usefulness of “face” screen, It is more expensive than similar machines.